The second and more powerful thing that impressed me about Let the Hurricane Roar is what a powerful picture of married love it presents. This is a true romance, one that I would hand over without hesitation to anyone who even remotely enjoys the genre. (For the record, romance ranks somewhere above horror stories and supernatural thrillers but below almost everything else in my list of favorites, but I really do like this one.) The thing that turns me off to romance–the sappiness–is almost entirely absent in this story, in my opinion. In fact, Lane writes with a very restrained hand; the tone is one of almost objective observation rather than involved emotion. While I can certainly appreciate how forlorn Caroline feels at time without Charles (and rightly so! I mean, this young woman is surviving on her own with a baby in a soddy in the middle of a blizzard! ), I never felt like my emotions were being manipulated, and I appreciate that very much. 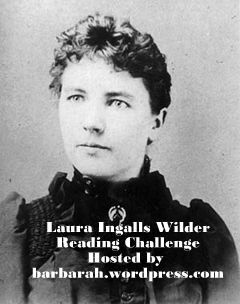 I read this book for the Laura Ingalls Wilder Reading Challenge at Stray Thoughts. Although this book isn’t by Laura, my reading of it was definitely inspired by our fondness for her works. I had forgotten about putting this on hold at the library after Carrie’s recommendation. I got this after seeing Carrie’s review but haven’t read it yet. If I am remembering correctly, I think Rose wrote this before Laura’s Little House books came out, and it sounds like she took different elements from different time periods and wove them together. I don’t think I could have been a pioneer woman, either. I’ve been going through the first two LH books and can’t help but notice, as you mention, how hard life was, how everything could be taken away in a moment, without any of the resources we have. That’s great! We’re weeding the collection at the library where I work, too, and I cringe to think of what I’ve unknowingly pulled for discard.